Early Summer - all colors. 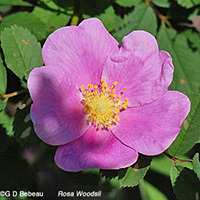 WILD ROSE COMPARISON: There are six species of wild rose on the current Garden Census. Details of each are given in a table below. 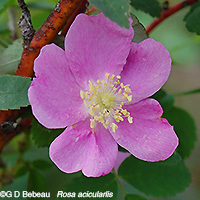 The flowers will all look similar other than for differences in size, position, and sometimes color. Most have some form of stem prickle, and all have pinnately divided leaves, with the number and style of leaflets varying. 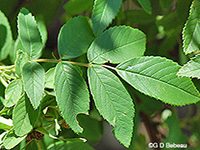 The red fruit known as Rose hips, add much red color to the fall landscape. 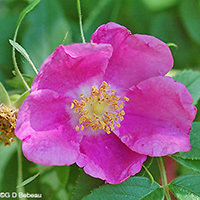 Click on the Rose name to bring up an information sheet with plant information and photos. 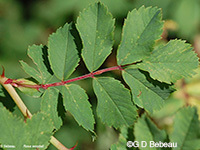 Thorns straight, rounded and near the nodes, more dense near ground none on new growth short, stubby, slightly curved, not numerous straight and unequal, densely prickled on lower stems and internodes. Sparser above. 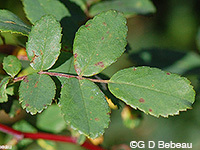 straight and unequal, densely prickled on stems and internodes. mostly without except at base of old stems. usually slightly curved, not dense, on old & new wood. 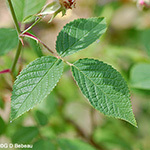 Leaflets 5 to 7 (9), oblong to rounded, coarse teeth, a few hair on the underside central rib, two winged stipules at leaf base. 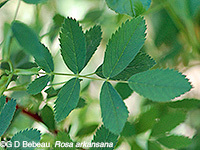 3, sometimes 5 on young growth, ovate to lanceolate with long pointed tips. 2 winged stipules at base of leaf, fine teeth. 7 to 11 oval to oblong, sharply toothed often fuzzy under. 2 stipules at base w/outward turned teeth at leaf base 5 to 9, elliptical to oval, often twice toothed, conspicuous winged stipules at base of leaf 5 to 7, sometimes 9, oblong, coarsely toothed, stipule with elongated teeth and may have glandular hair. 5 to 9 ovate or elliptical, sharply toothed toward tip. 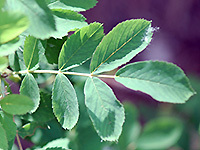 2 wide stipules at base of leaf. 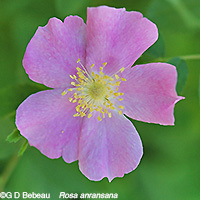 Minnesota Native status Not native, listed as native by one source, but no collected examples. Found in landscape collections. not native, found in landscape collections. native -the general species is widespread in state. Varieties more restricted. 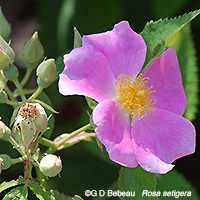 native- found in the NE quadrant and 3 SE counties native and found in most of the state native in scattered counties in the north 1/3 of state, a few south. 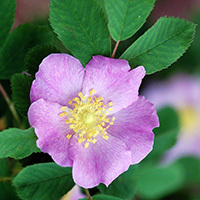 An information sheet on Swamp Rose, R. palustris, is also available (a plant not shown on this page).